G'day everyone. This is my first post. I am an Aussie. I have just bought a second hand 05 FS650E. Great bike. So I'd like to start with a problem I have noticed after my first ride and other than this the bike seems to be in pretty good nick for 13000 kms. Weather it's leaking from this area or just pooling there I'm not sure. It doesn't look to be running or dripping into this area so could it be coming from between the cases? It's not a lot of coolant but enough to annoy me. Very odd location. I would think it is coming from somewhere else. 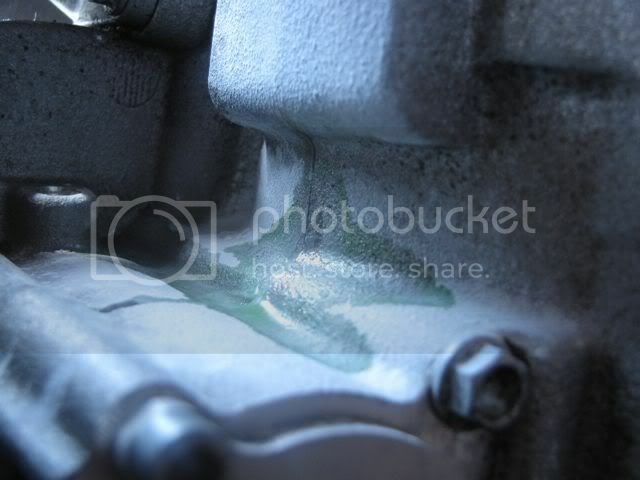 It could be coming from the case split where the cylinder is located or coming from the head gasket area and running down there and pooling there. Try a dusting of talcum powder on the barrel section of the case and it should show you where it's coming from. Thanks for the feedback fellaz. Great idea to use the powder Dale. I covered the area with powder and went for a 15 minute ride. I can actually see air bubbles popping out of there. Any ideas why coolant would be seeping from that split there? Yes, that is concerning. You might try retorqing the case halves, but I think that's wishfull thinking. Looks like the case halves and liner seals may have to be replaced. Again, pretty uncommon. Not that I am a proponant of it, but you might try some radiator sealer in it as a last ditch effort. It would be much cheaper than the other alternatives. Failing the sealant and retorqing the halves. Are you suggesting new cases or just the liner? he's suggesting neither. just a disassemble and reassemble with new rtv and new cylinder o- rings. exact same spot where mine was leaking after a rebuild, basically its the spot where the water jacket is thinest. split the engine and renew the rtv sealant, making sure there is enough at that spot ( thats where i went wrong) or stick some rad weld in the radiator. i went the rad weld route and so far its holding up nicely. Dale's just pointed out that you dont have rad weld in the states. Just user whatever radiator sealant you have, the type you tip in the rad to seal small leaks. Silver something? Thanks cypher for that info and diagram. I'm actually down under so I'll see what's available here. My only fear with using something like that is it blocking something that shouldn't be blocked. I'm glad you've had success using it because the alternative is a hell of a lot more work! Is Radweld a granule? Do you think the granules are a better solution than the liquid sealants?